Kerala state higher secondary (DHSE) Plus One (+1) board March examination 2015 timetable has been published along with the notification at the official website. Students who are appearing for the Kerala plus one examination 2015 shall go through the notification to get the time schedule for the upcoming examination. The first year exam will be conducted during the period 9th March – 30th March 2015. The department of higher secondary education Kerala has published a circular regarding for the upcoming Plus one examination to be conducted in March 2015. 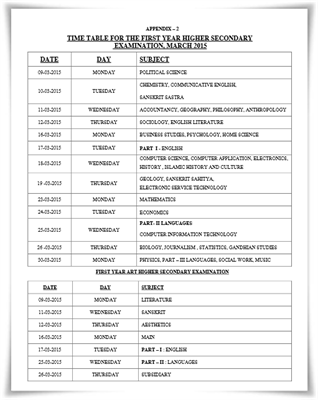 As per the notification, the first year exam is scheduled during the period 9th March – 30th March 2015. The first year higher secondary terminal evaluation (TE) will be conducted along with the terminal evaluation, March 2015. The scores obtained in the First Year examination shall be carried forward to the Second Year. Meanwhile the combined scores of First and Second Year examinations along with the grades obtained shall determine the eligibility of the candidate for higher studies. Regular candidates can register for the Higher Secondary Examination by remitting the prescribed fee at the school office before the last date. The fee for the Examination once remitted will not be refunded on any account. The first year improvement exam 2015 shall be conducted during August/September. As per the exam calendar, Political Science exam falls on 9th March 2015. The exam will be concluded on 30th March with Physics, Part III Languages, Social Work and Music. For the subjects without practicals, the exam will be conducted from 10.00 A.M to 12.45 P.M which include 15 minutes of cool off time. The last date of receiving the application for Plus One examination without fine is 5th November 2014. The first year candidate details will be published through the DHSE portal on 20th November 2014. Students can download their admission tickets from 12th February 2015. Instructions regarding proper behaviour inside the exam hall are given with prime importance in the circular. To become eligible for higher studies, a candidate should obtain D+ grade or above in all subjects. The minimum score required for terminal evaluation for subjects with practical evaluation is 36 while for subjects without Practical Evaluation it is 48. Students need to download the notification circular which gives complete details about the exam timetable and various forms to be used during the academic year. Kerala hscap plus one trial allotment 2014 results/list would be published after 12th June at hscap.kerala.gov.in, official website. Students who had applied for the Plus One admission under the single-window system can check their allotment status soon after the trial allotment get published in the website. As the trial allotment does not guarantee admission for the course, students should have to wait till the first allotment gets published.